The Association for Japan Exchange and Teaching (AJET) is an independent, self-supporting volunteer organisation. Comprised of current JET participants, AJET is the sole representative body for JET participants and works collaboratively with the JET Programme administrators in various ways to provide support and information to JET participants. AJET is organised into two distinct levels, National AJET and local AJET chapters. National AJET make decisions that are important on a national level and coordinate communication with related organisations. National AJET is comprised of officers who are elected by the JET community and serve for one year. These officers consist of three executives who administer AJET and eleven block representatives. In addition, there are several appointed officers who supervise various National AJET initiatives. National AJET’s primary role is to represent the opinions and concerns of the JET community as a whole. Twice a year an opinion exchange meeting is held with National AJET and the sponsors of the JET Programme, specifically the Ministry of Internal Affairs and Communications (MIC), the Ministry of Foreign Affairs (MOFA), the Ministry of Education, Culture, Sports, Science and Technology (MEXT), and the Council of Local Authorities for International Relations (CLAIR). In addition, National AJET offers a number of services to help support JET participants in their lives in Japan. The AJET Peer Support Group (PSG) is a confidential listening and resource line for JET participants. Staffed by trained volunteers, the line is open from 8:00 p.m. to 7:00 a.m. every night of the year. 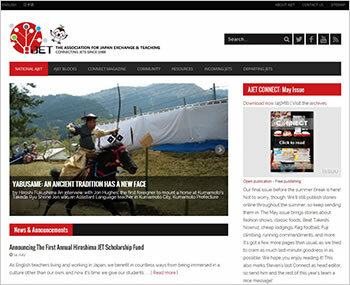 Other helpful services from National AJET include special offers and discounts from corporate affiliates, team teaching resources, special interest groups, the Tatami Timeshare Program (similar to couch-surfing but made by current JETs for current JETs), the AJET Connect Magazine and more. Block representatives serve and act as liaisons between National AJET and the local AJET chapters in their area. Local AJET chapters provide support, organise events, and keep JET participants informed of issues affecting them on a local level. For further information, please refer to the　AJET website.